Festivals bring happiness, togetherness and unique bonding among people and it is no different for the special individuals at Advitya, a creative centre for those differently- abled individuals (with[S1] Down's syndrome, Autism, Cerebral Palsy among others…) ,who are provided with vocational training and a vision to foster compassion, kindness and inclusion in the world. 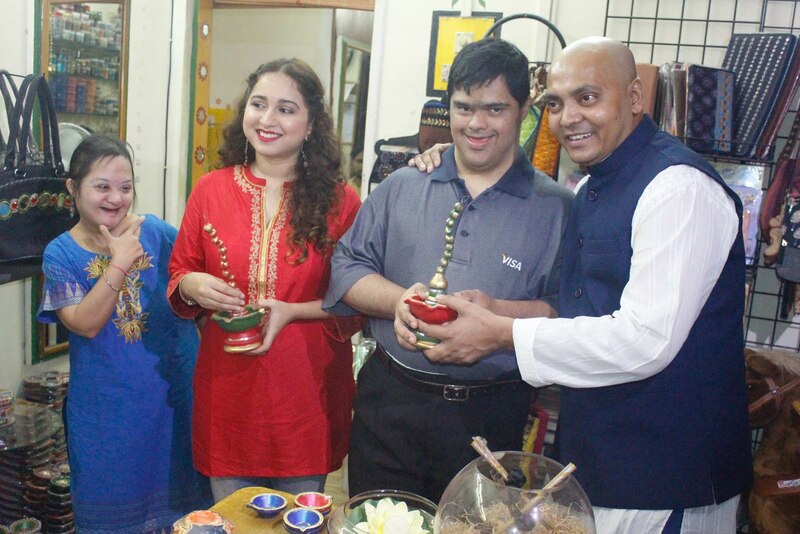 Through occupational therapy they engage them in adding value to a multitude of handicrafts. These activities help in developing fine motor movements, better eye & hand coordination and overall mental wellbeing. There is so much we can do differently when it comes to our festivals. This Diwali, Singer Prajakta Shukre, Actress Ragini Khanna and Producer Pankaj Narayan, come together to make this Diwali a time to spread love and cheer and put a smile on the faces of these special students of Advitya. Each with their unique personality and style, Prajakta, Ragini and Pankaj joins the Advitya students in singing, dancing and lighting up their lives. Ragini Khanna who recently was seen in Film Gurgaon said, "All of us receive gifts from our loved ones, plan what to gift them in return but it's seldom that we are able to bring a smile to some one's face, I feel, this Diwali I was able to do just that by meeting these kids and making it one my best Diwali celebrations." Prajakta Shukre, an ex-Indian Idol talent believes: "All of us are born different and behave differently, and it's our differences that make the world a very interesting place. Helping others gives me immense satisfaction. There is an unquestionable joy that bubbles up in us when we are positive influences in our community. We know that we can make a difference even when it may seem a drop in the ocean. What better time to make people happy than when we are celebrating Diwali, the festival of lights." Om Shanti Om (Reality Show) Producer - Pankaj Narayan elated at the occasion said, "As a writer and Producer I get to meet people several characters on screen and several people off screen but I must say, when I met these special kids today, the purity of thoughts and souls that I found, not only for my Diwali but I have made memories forever." The Event and get together was an annual Initiative by bubble – a marketing communication company founded by Aarti Notiyal, who believe that the biggest gift given is as big as the smallest smile added not just at Diwali but all around the year. No Comment to " Actor Ragini Khanna, Singer Prajakta Shukre & Producer Pankaj Narayan celebrate Diwali in a special way "